Nicholas is a professional software engineer with a passion for quality craftsmanship. He loves architecting and writing top-notch code. Remote workers are taking over the world. Toptal’s COO and cofounder, Breanden Beneschott, has been traveling since Toptal’s inception. After living in Bangkok for a year myself, I’m now moving back to Miami for a girl. But before I head home, there are more adventures to be had. She’s coming to travel with me, and until she gets here, I’ll be on a special mission from Toptal. 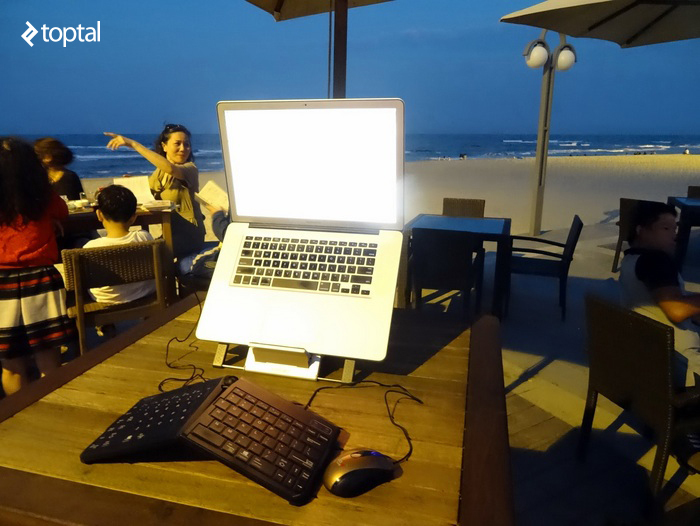 On a two-week assignment to the up-and-coming Vietnamese town of Da Nang, amid sunshine, sand, waves, and the Vietnamese people, I’ll be working from my laptop alongside a ragtag group of roaming geeks that calls itself Hacker Paradise. They’re hopping around Southeast Asia, changing the way remote workers live, and Toptal wants a man on the ground to see what they’re up to. Brothers and sisters, have you heard the Gospel of the Digital Nomad? It continues to spread far and wide. I was converted when I decided to move to Thailand with just some savings and a dream of a job that would let me work from anywhere. Believing in the value of my skillset, and confident that companies like Toptal were looking for people like me, I put my faith in the remote-worker fellowship and took the leap. I joined Toptal as a Technical Editor shortly thereafter, and since then I’ve been happily plugging away at my keyboard from such destinations as Laos, Hong Kong, Malaysia, and all over Thailand. People around the world are freeing themselves from the shackles of convention; on the beaches and the mountain tops, roving laptop-jockeys are pioneering a remarkable revolution, completely upending the way people live and work. Clients and employers are seeing the light, too, giving rise to new freelancing opportunities and enterprises like Toptal, and allowing people to build a promising career without sacrificing a fulfilling and vigorous life. The nomadic lifestyle is not a vacation, though, and working from the road can be difficult and isolating. There remains an impermeable barrier between the work world within the computer, and the real world outside of it. Beset by local language and cultural barriers, relieved only by backpacking dude-bros who are decidedly uninterested in buckling down for a few billable hours, lasting collaborative connections can be hard to develop without staying put for extended periods. Yet there is so much richness for the mind and the soul, so much intellectual stimulation and inspiration to be found on the road; it’s a genuine shame that we can’t build on it in the work we do, and with those we find around us. Making that dream a reality is the goal of Casey Rosengren and Alexey Komissarouk, founders of Hacker Paradise. As their website proclaims, Hacker Paradise is a, “traveling community of developers, designers, and other creative types.” It had its beginnings in the summer of 2014, when Casey Rosengren, Developer and Digital Nomad Extraordinaire, found himself working from the jungles of Costa Rica. As he told me, “Many of the people who visit Costa Rica are hard-partying backpackers, and I wanted to be around a group of people who were more serious, and working on projects they were passionate about.” So, he decided to do something about it. He struck a deal with a local hotel owner who was eager to fill his empty rooms with guests, and searched for a partner. He found one in Alexey Komissarouk, an Israeli developer and fellow University of Pennsylvania alumnus. Alexey had recently received news that his US visa, which could only be renewed via randomized lottery, had not come up in the latest selection. He would have to leave the country soon. “I had always talked about wanting to travel and work,” he says, “Now I suddenly was offered a chance to do exactly that. The visa lottery was just the final straw.” Seizing the opportunity to become a digital nomad, he flew to Costa Rica, where he and Casey started recruiting hackers to come work from paradise. The first Hacker Paradise, a 12-week stint on Costa Rica’s Pacific coast, took place during the fall of 2014. It was a great success, with two dozen participants coming together from all over the world. Before it was even over, Casey and Alexey were planning the next one. This time, to kick things up a notch, they would take the show on the road. The second installment of Hacker Paradise is currently ongoing; starting in February, the group spent a month in Da Nang, where I joined them for two weeks. Then they took to the skies in twos and threes, to regroup in Ubud, on the Indonesian island of Bali. In a couple weeks, they will move one more time, to Chiang Mai, Thailand, for the final month of their Southeast Asia tour. Along the way, participants may come and go as they see fit, and many join together for side trips between, and during, stops. Hacker Paradise creates an ideal environment to work alongside other digital nomads while traveling. It is not a holiday, so those who apply must have something to work on. While the venture is designed by developers and is geared towards the technical community, other creative types are more than welcome. The application is a straightforward process that involves filling out a brief form, doing a short Skype interview, and placing a down payment to reserve your space. Once your spot is confirmed, you are responsible for getting yourself to each location. Your Hacker Paradise experience is flexible; if three whole months on the road is outside of your scope, you can book as little as a week or as much as a month at a time, and you can extend as you see fit. Some participants even attend for a week or two in one location, head off to travel on their own, and rejoin at a different location for another dose of geeky goodness. The daily activities are only minimally structured, and in each location, people organically find the best ways to make things work. Dedicated co-working spaces are booked in each location, but those who prefer to roam further scout out cafes and bars, quickly unearthing the spots with good Wi-Fi, plugs, and coffee. For those interested in mentorship or extra accountability, check-ins are held every morning to discuss the progress people are making. A weekly Demo Day is organized, where everyone who wishes can showcase what they’re working on before heading out for a big group dinner. For team communication, Hacker Paradise makes use of Slack, where news of newly-discovered local wonders spreads quickly. When you’re ready to close your laptop and take a break, the opportunities to unwind with your newfound friends are endless. On Slack, one can always find something going on, whether it be a game of frisbee on the beach, a day trip to some nearby ruins, a rock climbing excursion, a few hours exploring the town, or even just a bite to eat at the local noodle stand. I’m pumped to find a local gym, where I can use the equipment for a dollar a day, and even find myself surfing, one choppy morning, for the first time in my life. Casey and Alexey, with the help and labor of their inestimable program manager and logistical powerhouse, Nicole Kelner, organize at least one day trip for the whole group in each location. In Da Nang, they take us down the coast, to the ancient town of Hội An, complete with a morning boat trip to the Chàm Islands for breathtaking coral reef snorkeling. In the evenings, it is easy to find someone to get dinner or drinks with. Unwinding after a days work, the intellectual conversation spills forth, often building on the work people have done that day, or picking up where the conversation left off the evening before. New ideas are struck upon, and opportunities for collaboration are fomented. The day I land in Da Nang, I am greeted at the hotel by Casey, who takes me to À La Carte, a swanky hotel where the nerds have infiltrated the ritzy rooftop bar. Commanding a quintessentially enviable view of the South China Sea, we work here for several hours, before heading out to the beach for a game of Ultimate Frisbee under the setting sun. It’s a full and satisfying first day, perfectly balanced between productivity and adventure. During the days that follow, I plan and book flights to India to meet my girlfriend, familiarize myself with the local cuisine, and work – a lot – publishing articles, corresponding with authors and coworkers, solving problems. This is an oasis of geekdom, and I am surrounded by some of the brightest people I’ve ever had the privilege of learning from. On a sunny afternoon, I work from the beach bar with Pedro, a Portuguese architect, whose screen always seems to have some monumental CAD design rotating on it. (“Here’s a museum I worked on in Dubai,” he says during one Demo Day, flipping nonchalantly through a slide of a massive building.) He comes from the world of universities and research institutes, where the papers you’ve published are the measure of your worth as a human being. He explains to me, in detail, how the h-index, academia’s de-facto quantification of how much you deserve to live, is completely hackable, and is eroding the the quality of the academic community and the work it produces. Another day, I find myself getting lunch with Jay, who thinks everything I say is hilarious and so, naturally, is one of my favorite people to hang out with. Jay has built some useful tools and licensed them to a few big clients, and now roams around Southeast Asia at his leisure, learning Thai and Vietnamese, and dreaming up his next product. I get the impression he’s the kind of guy that can conjure success out of thin air. We eat at Tam’s Pub and Surf shop, which Tam has plastered with pictures of American tanks and GIs. Half the photos feature Tam herself as a girl. In the laid-back tourist-town of modern Da Nang, it is easy to forget that so much violence has occurred here, but during the height of the war, the US airstrip at Da Nang is said to have been the busiest airstrip in the world. Jay and I talk history and the changing landscape of the world, over gigantic greasy cheeseburgers that would comfort the most shellshocked marine. The best measure of a group’s constitution is how they react in a difficult situation. A brainy debate on the everlasting superiority of Emacs might help determine who is the 1337est nerd of all, but when things suddenly get serious, all the hotkeys in the world won’t do an ounce of good. Fortunately, Hacker Paradise brings together natural team players. When one of our members, Emma, has a medical emergency and goes to the local ER, the entire group pulls together to make sure she gets the best possible care from the hospital, and the unwavering support of her newfound hacker family. Casey and Alexey take charge of organizing the group. Others immediately step up to provide translation services with the doctors, manage Emma’s care, and sleep at the hospital to keep a watchful eye on her. After a few days, she fully recovers, and is released from the hospital. Everyone breathes a sigh of relief. We are still little more that strangers, but it is good to know we can count on each other. One of the greatest rewards of working with Toptal is getting to work with people all over the world, and glimpsing what life is like where they are from. My colleagues on the editing team live and work in the US, Bosnia, and Bangladesh, and I’ve published authors from São Paulo in Brazil, Alexandria in Egypt, Zagreb in Croatia, Dar es Salaam in Tanzania, Nanjing in China, Szeged in Hungary, and Malta, in the middle of the Mediterranean Sea. I’m always eager to ask questions, and learn what’s going on in other parts of the world. A few weeks before finding out I’m headed to Vietnam, I happened to publish an article by Toptal developer Quân Lê, about class reloading in Java. I enjoyed working with Quân, who lives in Vietnam’s capital, Hanoi. I’ve always wanted to visit Hanoi. I get in touch with Quân and tell him I will be in town. I make it to Hanoi a few days before Vietnam’s biggest and most important celebration; the lunar new year, Tết. Being a dumb Westerner, I have presumed that Tết is a massive festival, but it turns out it is a time for family, when shops are closed and the streets are empty for several days. Nevertheless, Quân takes an afternoon off to ride his motorbike into town and hang out. I cling to the back of his scooter, in the oversized pullover I didn’t realize I’d actually need, and we ride around Hanoi’s dense and historic Old Quarter. We stop at a famous ice cream parlour, and chat about juicy topics like religion, Marxism, politics, and money. Quân is only the second Toptal person I have ever met face-to-face. He is cool. I tell Quân I will come back again after I leave Hacker Paradise, when the obligations of Tết are not placing so many demands on his time. When my Hacker Paradise assignment ends and my two weeks in Da Nang draws to a close, I am given the opportunity to make one final connection. Some Hacker Paradise guys plan a trip to Hanoi, and it happens to coincide with the day I return there myself. We arrange to meet for dinner in the Old Quarter, and Quân joins us. As this digital nomad blog post is being published, we are excited to inform our community that Toptal has become the main Hacker Paradise sponsor. We are certain that our two awesome organizations together can lead to amazing things. We will continue to support and encourage Toptal team members and freelancers to become digital nomads and explore the world, and to boldly code where no coder has coded before. Hacker Paradise is open to anyone who is eager to learn and grow, from veteran developers and designers to those who are just starting their careers. However, just as Toptal accepts only the top 3 percent of freelancers, Hacker Paradise also strives to maintain an exceptional community of members, who are motivated and intent on being productive. That is what makes it so worthwhile. The gang in Da Nang was populated primarily by people from Europe or the Americas, but I’ll boldly speculate that it will reach even further, bringing even more disparate people together. At Toptal, I am reminded every day that there are incredibly talented and thoroughly cool geeks in all corners of the world, who will only enrich the Hacker Paradise community. The internet age is doing wonders to help people from all backgrounds connect and understand each other better, but to really break down barriers, there is nothing like traveling together. Hacker Paradise will be making it’s next move, to Chiang Mai, Thailand, in late April, 2015. Casey and Alexey are already planning the following installment, eyeing Berlin, as the next nexus of nomadic nerd-dom. If you’re interested in joining them, go ahead and apply. Adventure awaits you! I’m writing from a hostel in Siem Reap, Cambodia, my girlfriend waiting patiently for me to close my laptop and head out to tour the magnificent ruins of Angkor. After leaving Vietnam three weeks ago, we met in the middle of the night on the other side of airport customs in Kolkata, India. This is the first time we have travelled together, and we are both learning a lot. When it comes to testing a new relationship, there is no better way to get to the point. Fortunately for me, the adventure is only getting better. I’m grateful to Toptal and Hacker Paradise for paving the way for people like me to have such rich experiences. The world is a gift to be shared. Wherever you are, I hope we cross paths someday. Dude! That's awesome! I chatted with Alexey about a month ago, and Hacker Paradise seemed absolutely amazing. I might catch you guys in Chiang Mai if you're still there at the end of May. All the best! I applied to the Euro area for this Summer. Any other Euro web dev nomads out there? Thanks Quan! It was a real treat and honor to be your guest. I hope to see you again someday! Dude! Do it! Chiang Mai is really nice. I guarantee you'll have an awesome time. This is so stellar!! :D I've just applied. Thanks for the great article, Nick. I wouldn't have known about this without you! My life has been changed by this post.